Pruitt hauled in both of his targets for 26 yards in Sunday's 33-17 loss the Colts. Pruitt hauled in two of his three targets for 29 yards and a touchdown in Saturday's 25-16 win over Washington. 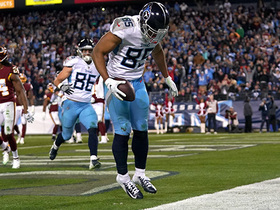 Analysis: Pruitt saw a season-best three targets and led the Titans' tight ends with 29 yards and a touchdown. While he did little to capitalize on Jonnu Smith's (knee) absence in Week 15 against the Giants, the athletic tight end hauled in a two-yard score to give the team a 19-16 lead late in the fourth quarter. Pruitt will almost certainly be buried on the depth chart heading into the 2019 season, meaning he'll continue to be of little fantasy consequence. Pruitt caught one of his two targets for two yards in Sunday's 17-0 win over the Giants. Analysis: Pruitt failed to make an impact in the absence of Jonnu Smith (knee), hauling in only one pass for the fifth consecutive game. He's also shown little ability to turn his opportunities into significant yardage, averaging just 9.4 yards per catch. As a result, he is not relevant in any format. Pruitt hauled in his lone target for nine yards in Thursday's 30-9 win over the Jaguars. Analysis: Pruitt has recorded one catch on one target in each of the four games he has been active this season. 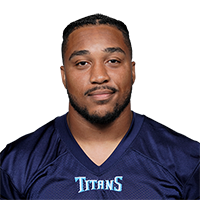 Though the Titans' tight end corps remains crowded, Jonnu Smith's (knee) season-ending injury could open up a few more targets for Pruitt to close the season. There's little indication he'll be able to take advantage, however, as he has averaged just 9.2 yards per catch and recorded zero touchdowns in 32 career games. Pruitt caught his lone target for 13 yards in Monday's 34-17 loss to the Texans. 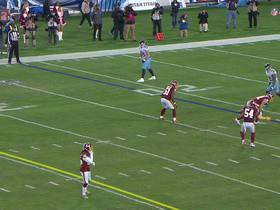 Analysis: Pruitt's reception converted a first down on the Titans' opening drive of the second half. It was just his second catch of the season and there is no obvious path to him becoming more involved in the passing game. Fellow tight ends Jonnu Smith and Anthony Firkser have both seen more consistent targets from Marcus Mariota. Pruitt caught his lone target for 19 yards in Sunday's 38-10 loss to the Colts. Analysis: Pruitt was one of four Titans tight ends to haul in a pass Sunday, recording his first catch of the season and as a member of the team. He set up the team's lone touchdown of the game, getting pushed out of bounds at the 1-yard line. The game was already well in hand for the Colts at that point, making Pruitt's contributions largely meaningless. Don't expect him to be a big part of the Titans' game plan going forward.